Since the new Prudential Regulatory Authority underwriting standards came into force on 30 September, lenders, brokers and landlords have navigated a challenging legislative landscape intended to reduce riskier lending. Portfolio landlords (those with four or more mortgaged buy-to-let properties) are now subject to increased scrutiny when remortgaging or taking out a mortgage on a new property. The PRA’s rules set out minimum expectations for firms underwriting BTL mortgages, with bricks and mortar assets coming under the regulatory spotlight. Lenders must now consider landlords’ full financial exposure on income and borrowing, with the financial sustainability of their entire portfolio being examined. For a small number of lenders, the new requirement to assess the viability of all mortgaged properties in a portfolio has created sufficient concerns that new lending to portfolio landlords has all but halted. For others, limits to the portfolio sizes they will consider for applications have been introduced. Yet more have hesitated until the eleventh hour to announce how their policies on portfolio lending will change, hinting at a lack of certainty on the future role these lenders will play in the BTL market. It’s vital that regulatory challenges don’t constrain stakeholders, and that all players in the mortgage market remain capable of managing this increasing burden of compliance. These challenges should not limit product choice either. Sourcing suitable products will be increasingly difficult as the number of variables governing product selection have multiplied since 30 September. Without the right systems in place to manage this increased administration, life will undoubtedly be more difficult for those having to deal with time consuming portfolio submissions, data validation and lengthy delays. 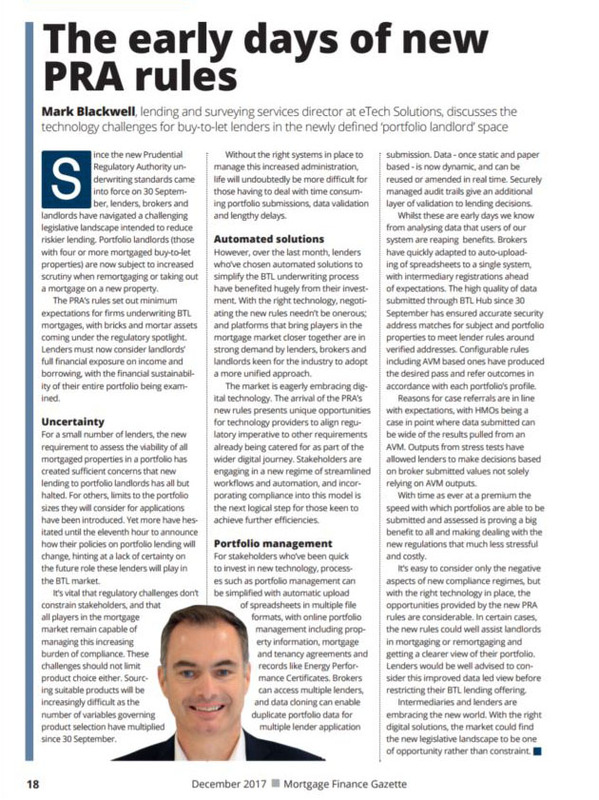 However, over the last month, lenders who’ve chosen automated solutions to simplify the BTL underwriting process have benefited hugely from their investment. With the right technology, negotiating the new rules needn’t be onerous; and platforms that bring players in the mortgage market closer together are in strong demand by lenders, brokers and landlords keen for the industry to adopt a more unified approach. The market is eagerly embracing digital technology. The arrival of the PRA’s new rules presents unique opportunities for technology providers to align regulatory imperative to other requirements already being catered for as part of the wider digital journey. Stakeholders are engaging in a new regime of streamlined workflows and automation, and incorporating compliance into this model is the next logical step for those keen to achieve further efficiencies. For stakeholders who’ve been quick to invest in new technology, processes such as portfolio management can be simplified with automatic upload of spreadsheets in multiple file formats, with online portfolio management including property information, mortgage and tenancy agreements and records like Energy Performance Certificates. Brokers can access multiple lenders, and data cloning can enable duplicate portfolio data form multiple lender application submission. Data – once static and paper based – is now dynamic, and can be reused or amended in real time. Securely managed audit trails give an additional layer of validation to lending decisions. Whilst these are early days we know from analysing data that users of our system are reaping benefits. Brokers have quickly adapted to auto-uploading of spreadsheets to a single system, with intermediary registrations ahead of expectations. The high quality of data submitted through BTL Hub since 30 September has ensured accurate security address matches for subject and portfolio properties to meet lender rules around verified addresses. configurable rules including AVM based ones have produced the desired pass and refer outcomes in accordance with each portfolio’s profile. Reasons for case referrals are in line with expectations, with HMOs being a case in point where data submitted can be wide of the results pulled from an AVM. Outputs from stress tests have allowed lenders to make decisions based on broker submitted values not solely relying on AVM outputs. With time as ever at a premium the speed with which portfolios are able to be submitted and assessed is proving a big benefit to all and making dealing with the new regulations that much less stressful and costly. It’s easy to consider only the negative aspects of new compliance regimes, but with the right technology in place, the opportunities provided by the new PRA rules are considerable. In certain cases, the new rules could well assist landlords in mortgaging or remortgaging and getting a clearer view of their portfolio. Lenders would be well advised to consider this improved data led view before restricting their BTL lending offering. Intermediaries and lenders are embracing the new world. With the right digital solutions, the market could find the new legislative landscape to be one of opportunity rather than constraint .